Alice Esther Belmore was born in 1888, a talented daughter and the second of five children to George Belmore and Jessie Danvers, both of whom came from established theatre families. 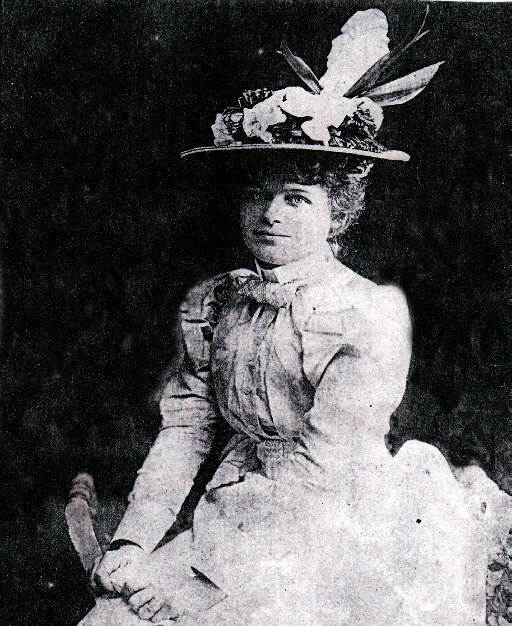 The early death of her successful father George Belmore in 1899 encouraged her mother to use her family ties to further her daughter’s career in the theatre. It was around this time that Alice was successfully introduced to the Royal Masonic Music School for Girls. As a teenager Alice Esther become a successful theatre actress, and early on in her professional career she was cast in major roles in the West End. 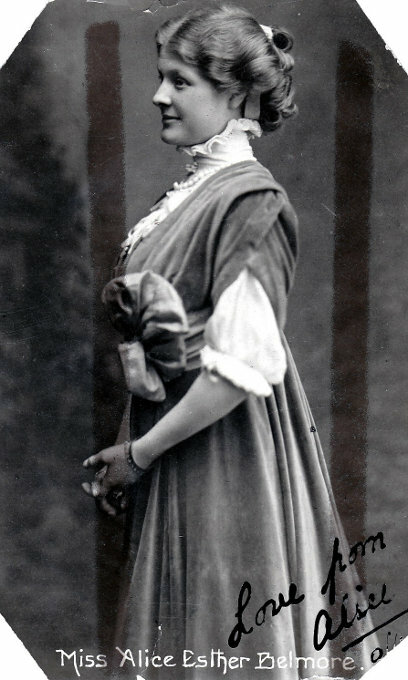 She played Sophie, in Back to the Land, 1905 at the Savoy theatre, and Kitty in Ben-My-Chree, 1909 at the Prince’s Theatre; a clear testimony to her talent and her charisma. 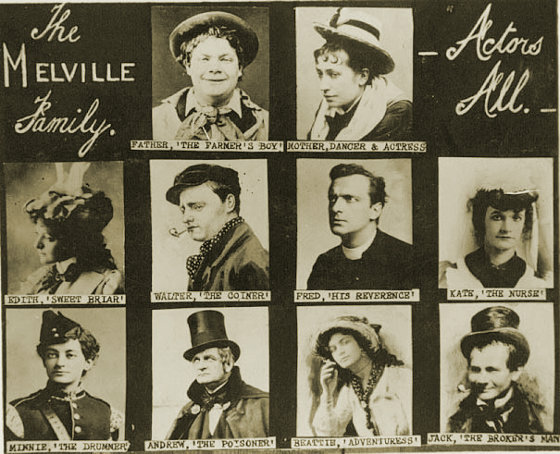 As Alice’s popularity increased, she went on to appear in a series of successful productions at London’s Lyceum Theatre, mounted by Walter and Frederick Melville, popularly known as the Melville Brothers. Both brothers were authors and producers in many of London’s Victorian and Edwardian theatres including The Lyceum in the West End. 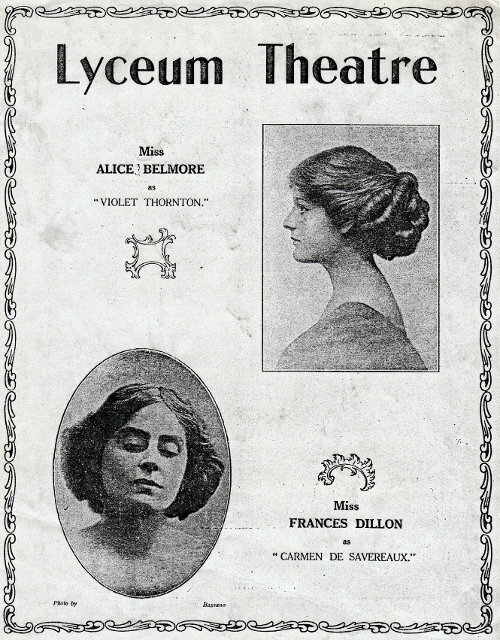 Alice’s biggest Lyceum successes included The Monk and the Woman, and Women and Wine, both produced in 1912. 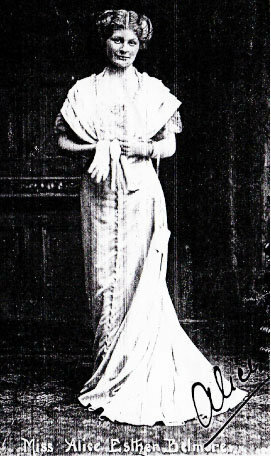 Alice Esther went on to play Mercedes in Monte Cristo in 1913, and Lucy in Her Forbidden Marriage, 1915. In later productions Alice is worked with her step-father, her mother Jessie’s new husband Gilbert Heron. Alice showed a great range as an actress, appearing in a variety of Shakespearian roles as well as many of the popular melodrama and contemporary comedies of the period. Alice regularly appeared alongside other members of both her father’s and mother’s extended families in popular Christmas pantomime spectaculars at the Lyceum. In the very early years of the British film industry Alice began appearing in films made for the British Empire Films Company. Titles included The Shop Soiled Girl, Screen Struck, and the Female Swindler. Once again Alice demonstrated her talents, but this time on celluloid, quickly establishing herself in major film roles. From around 1915 Alice was in a string of films produced by Frederick Melville’s production company in their London Studios of the time. Well known as she was for her acting, she was also a popular and prominent part of the Belmore dynasty. She was loved by the family for her kindness, her natural intelligence and her warm personality. Alice remained, until her sad death, a good daughter, a supportive sister and always a loyal and popular aunt. Although there is little known about Alice’s personal life. After years working on the stage with the Melville family, British Empire Films, started by Frederick Melville, employed Alice as a star actress in the company. The British industry was in its infancy in the early years of the twentieth century, and although it was small in comparison with its American cousin, it became quickly successful and very popular with British audiences prior to the outbreak of The Great War. From the age of 16 Alice had a great relationship with the Melville family, a family of musicians, academics, producers and actors. The brothers Frederick Melville and Walter Melville were very keen playwrights and immediately took a shine to Alice’s talent and charm. They shared the proprietorship of the Lyceum Theatre in The Strand, putting on their own plays, and staging elaborate pantomimes. Of the work they wrote themselves, they became best known for writing what became known as ‘Bad Women Dramas’. These were plays about women who would make terrible life choices or cause trouble in some form. 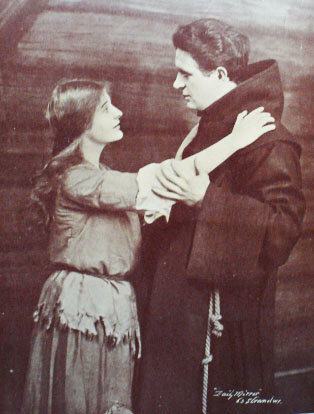 The brother’s interest in Alice’s career played an important part in her success in three of Alice’s major roles, Monte Cristo, The Monk and the Woman, and Her Forbidden Marriage. Sadly, at the height of her powers as an actress Alice Esther Belmore’s career and her life was cut short. In 1919 and at the young age of 29, Alice died while undergoing a simple operation. This was a loss for the theatre and for the film industry and a huge loss for her family. Alice Esther’s mother Jessie Danvers also lost two of her sons during the war years and the loss of such a beautiful daughter at so young an age must have been a terrible shock for all the family. During her career Alice worked in pantomime, music hall, on the Shakespearean stage, as well as in both drama and comedy. Back to the Land, at the Savoy theatre in Aldwych, at that time owned by the Melvilles. On the 15th of July, 1909, Alice Ester married Victor Claude Rayment in Lambeth, London. Her stage named continued to be Alice Belmore. Her aunt, Alice Maude Belmore, usually went by the stage name of either Alice Belmore Cliffe or Alice Cooper-Cliffe, as she was married to a great actor Henry Cooper-Cliffe. Alice Belmore Cliffe’s acting career took her to Broadway, New York, so there wasn’t really any conflict of names. 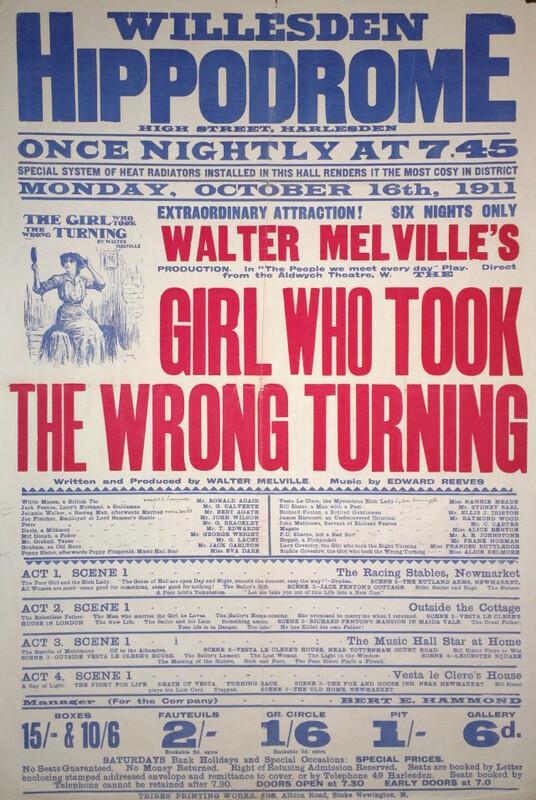 The Girl Who Took the Wrong Turning, at the Savoy theatre, as the lead character Sophie Coventry. The Girl Who Took the Wrong Turning, at the Willesden Hippodrome, as the lead character Sophie Coventry. 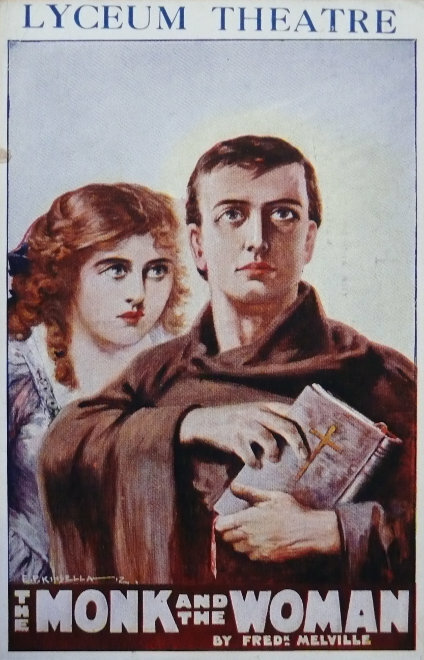 The Monk and the Woman, at Lyceum Theatre and Princess’ Theatre. A Fredk. Melville production, produced by both Melville brothers. Women and Wine, at Lyceum Theatre. Written by Walter and Fredrick Melville. Monte-Cristo, at Lyceum Theatre. Written by Walter and Fredrik Melville. A Queen for a Wife, at Theatre Royal, Leeds. Written by Jack Denton. 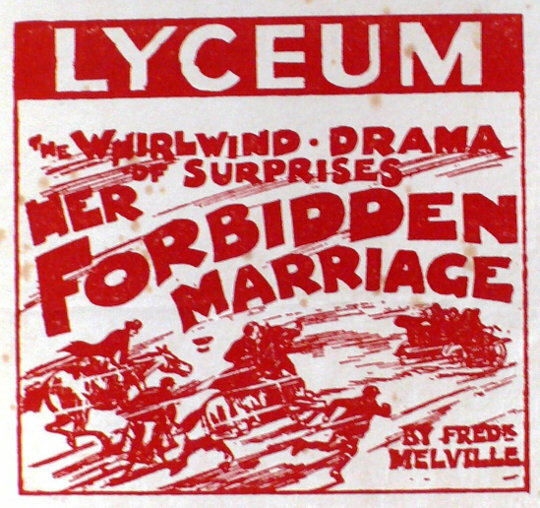 Her Forbidden Marriage, at Lyceum Theatre. A Fred Melville production. Also starred Gilbert Heron, Alice’s father-in-law. Between Two Women, at Lyceum Theatre. Also starred her brother George Victor Belmore. 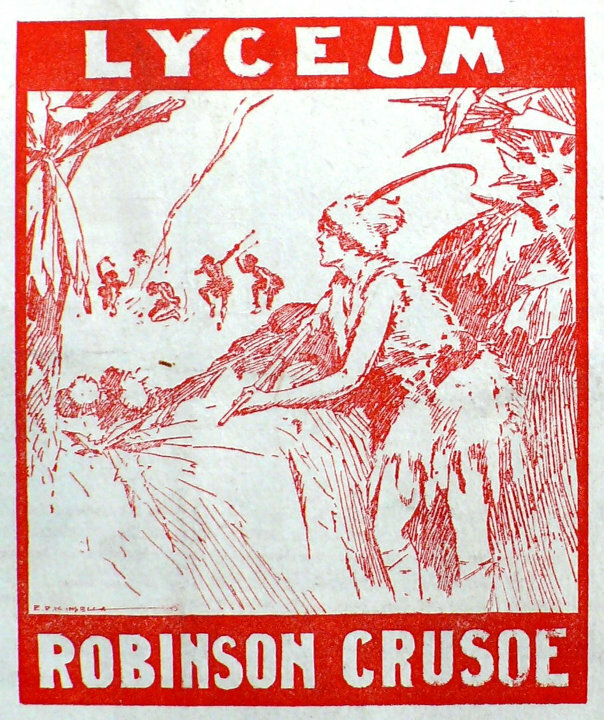 Robinson Crusoe, at Lyceum Theatre, as Captain Cutlass. Also starred her brother George Victor Belmore. Robinson Crusoe, at Princess Theatre, as Captain Cutlass. 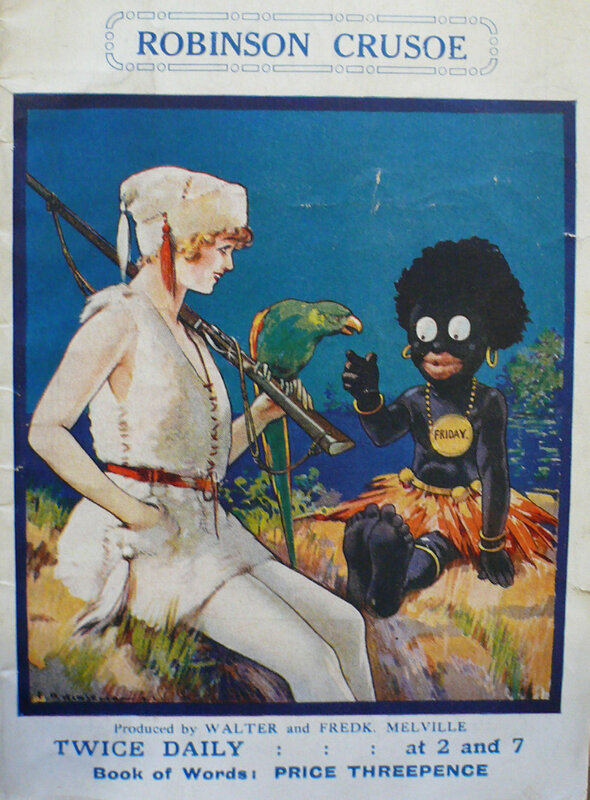 This was a Christmas pantomime Also starred her brother George Victor Belmore. Written by Walter and Fredrick Melville. Women and Wine, at Lyceum Theatre. Shop Soiled Girl, by British Empire Films. Adapted from a play by Walter Melville. Alice’s name was the first billed. Directed by Leedham Bantock. The Girl Who Took the Wrong Turning. Based on a play by Walter Melville. 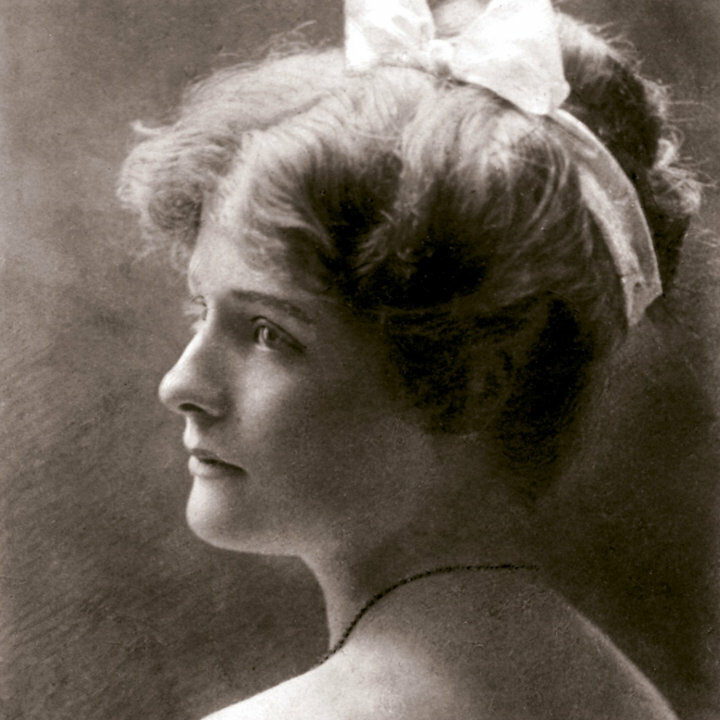 Alice reprised her role from the 1910 stage version as Sophie Coventry. Screen Struck, as the leading lady, by British Empire Films. The Girl Who Wrecked His Home, by British Empire Films. Based on a play by Walter Melville. The Female Swindler, by British Empire Films. Based on a play by Walter Melville. In November 1917, Alice Ester died from an illegal abortion, at just 29 years of age.